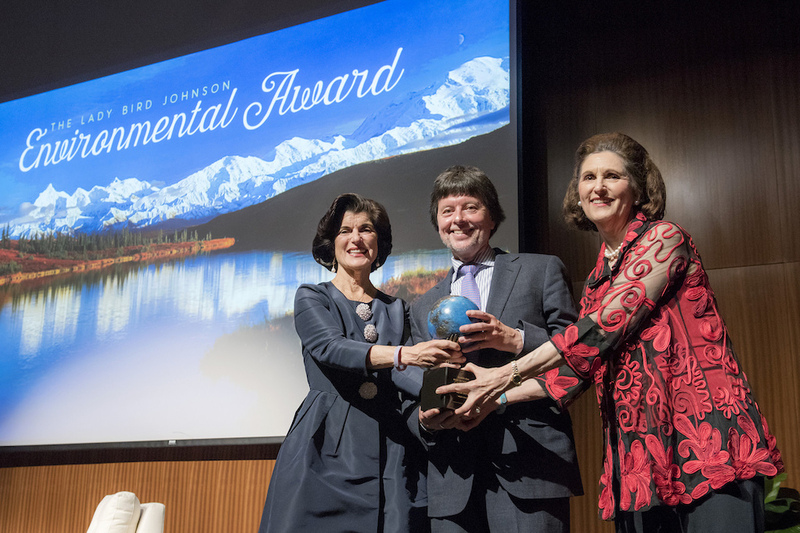 The 2017 Lady Bird Johnson Environmental Award has been presented to Ken Burns for reawakening a nation’s consciousness to the natural world through his work, including The National Parks: America’s Best Idea. As a direct result of the publicity and broadcast of this documentary, national parks across the country saw a dramatic increase in attendance. Burns has directed and produced some of the most influential, important and popular historical documentaries of our time. The $25,000 award was given to Burns on April 27 at a program at the LBJ Presidential Library in Austin, Texas. Presenting the award were Lyndon and Lady Bird Johnson’s daughters, Lynda Johnson Robb and Luci Baines Johnson. The Lady Bird Johnson Environment Award honors outstanding achievements in the preservation, restoration or improvement of the natural world that embrace Mrs. Johnson's style, energy and commitment to her work. Its mission is to increase public awareness of the environmental challenges facing our country by highlighting the work of selected individuals, corporations, and non-profit organizations. In his forty years of filmmaking, Burns has reached millions of viewers of PBS through his inventive style of storytelling. “The National Parks: America’s Best Idea,” broadcast on PBS in 2009, captured an idea as uniquely American as the Declaration of Independence and just as radical: that the most special places in the nation should be preserved, not for royalty or the rich, but for everyone. It was filmed over the course of more than six years at some of nature’s most spectacular locales — from Acadia to Yosemite, Yellowstone to the Grand Canyon, the Everglades of Florida to the Gates of the Arctic in Alaska. The musician Wynton Marsalis has called Burns “a master of timing, and of knowing the sweet spot of a story, of how to ask questions to get to the basic human feeling and to draw out the true spirit of a given subject.” Burns’ films have won fifteen Emmy Awards and two Oscar nominations, and in September of 2008, at the News & Documentary Emmy Awards, Ken was honored by the Academy of Television Arts & Sciences with a Lifetime Achievement Award.